Look what greeted me as I walked onto the train this morning? First of all, one of my many 2012 new year resolution....to update this blog more often! BART is never boring....I see and hear things everyday but I need to do a better job of jotting down my observations here! 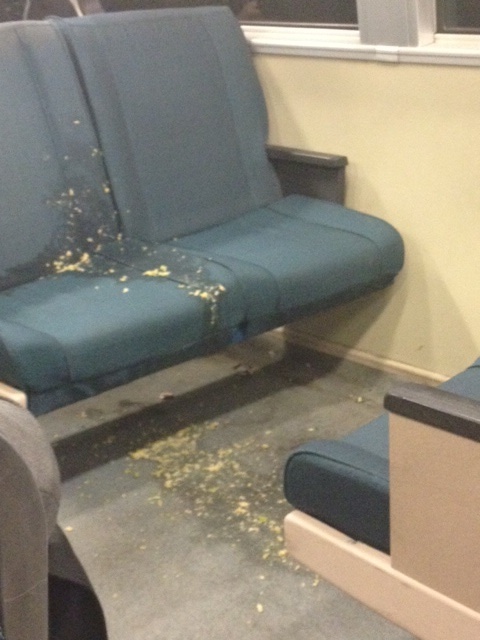 So, we all know BART seats are disgusting. But this photo I snapped today really says it all. Whoever did this must have had QUITE a breakfast! I wonder who they'll clean it off. We know they won't be disinfecting the seats so I guess we all need to be careful to avoid any seats with stains. Oh wait, that is ALL the seats! Perhaps I shouldn't complain when I need to stand on BART...probably more sanitary. Apologies for this graphic photo but wanted to make a point here! It doesn't get too much worse than this.